newyork – Now Beer This! Sometimes, when several things come together, it’s described as cosmic. 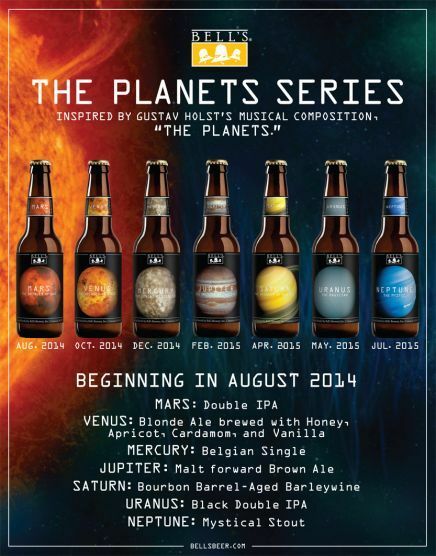 I can think of no better word to describe Bell’s Brewery’s latest beer series, “The Planets”. Music, beer, and astronomy combine for this series of seven beers inspired by The Planets. English composer Gustav Holst wrote The Planets between 1914 and 1916. It is a seven-movement orchestral suite, with each part representing a planet of the Solar System that was known at the time, with the exception of Earth. Check out the whole thing below. This idea of drinking beer right away makes me very happy. Although I do have a few bottles aging away, I think it is great that Bell is encouraging good beers that are ready to consume at their best when they are released. In keeping with the theme of this blog, I should mention that a few bands have been inspired to do their own take on The Planets as well. Check out King Crimson’s take on “Mars” from their 1969 performance at the Fillmore. Bathory also arranged part of “Jupiter” on their song “Hammerheart” from 1990’s Twilight Of The Gods. Mars, the Bringer of War, which is a double IPA, will be the first to arrive and be released in August. The schedule for the rest of the beers to be released is below. I think I am most looking forward to the Venus beer, and “Neptune, the Mystic” which is said to be inspired by one of Bell’s homebrews, “Dr. Bell’s Medicinal Stout”. Check the Bell’s website for more info on where to find these cosmic beers!